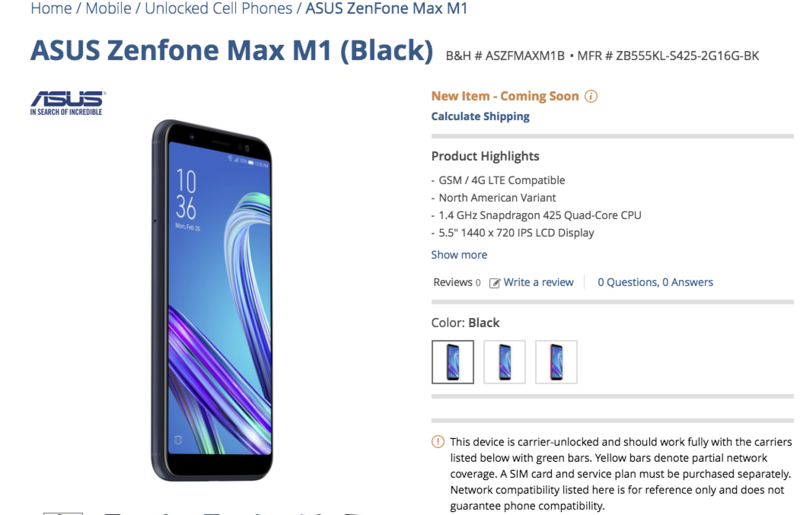 Earlier this year at MWC, we have seen Asus unveiling its Zenfone Max (M1). Now the device is up for pre-order in the US via retailer B&H for $169 for the Snapdragon 425 model. The handset was unveiled in Snapdragon 425 SoC model as well as in Snapdragon 430 with a 5.5-inch touchscreen display. The device will be available in Gold, Red and Black color variant but there is no information on the actual availability of it as the listing just indicates as coming soon. The Zenfone Max (M1) comes with a 5.5-inch display as mentioned earlier and this midrange device has 720 x 1440 pixels resolutions give a pixel density of 245ppi. The smartphone comes out of the box with Android 8.0 Oreo operating system with Asus Zen UI 5.0 on top. This variant is going to be powered with Snapdragon 425 processor with four cores at a clocking speed of 1.4 GHz. There is an Adreno 308 GPU attached to it along with 3GB of RAM. The onboard storage of the device is 32GB which can be extended further up to 256GB via dedicated microSD card slot. The handset comes with a glass on the front while has an aluminum body giving the smartphone an elegant look and feel. Moreover, the smartphone supports Dual SIM connectivity with support for two Nano-SIM cards. There is a 13MP + 8MP camera setup on the rear with LED flash and PDAF. On the front, Asus has provided 8MP camera sensor for selfies with EIS. Asus has provided a rear-mounted fingerprint sensor along with the sensors like accelerometer, proximity, and compass. There are other connectivity options like Bluetooth v4.0, WiFi 802.11 b/g/n, GPS, AGPS and few more. There is a non-removable 4000mAh battery on the back to power the handset. To pre-order the handset click on the source link given below and if you have more queries, do comment in the section below and stay tuned to Android Advices for more.